1. They serve my espresso in a large paper cup. Sorry, espresso is meant to be savored and to do so you need to serve it in a heavy, Italian demitasse cup. 2. I order a double espresso and it is practically a large as a small coffee! A double espresso should be no larger than 2.5 ounces. I pull mine at about 2 ounces max. 3. The menu board takes up practically the whole wall. 4. There are more non-coffee items on the menu than coffee items. Sure, I understand economics and the need to be viable in the middle of the day, but I like coffee shops that specialize in…wait for it…wait for it…coffee! 5. They don’t roast their own coffee…or at least get it form someone close by who does. 6. All the customers look alike. I like diversity. That is part of the social draw. 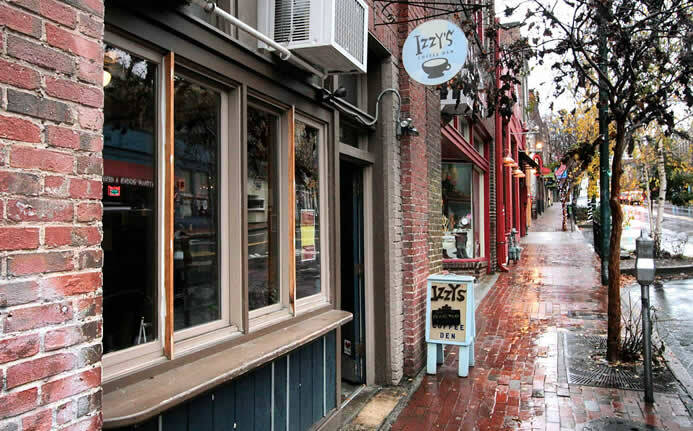 Just check out the home page of Izzy’s Coffee Den in Asheville. They take on all comers. I’ve been there and I can vouch that their welcome is true! 7. It is full of a bunch of coffee snobs like me! Recommend any good coffee shops on Evansville??? Well, better late than never! I forgot to reply to your question. Actually I don’t really know much about the coffee scene in Evansville. I have not been there in years.